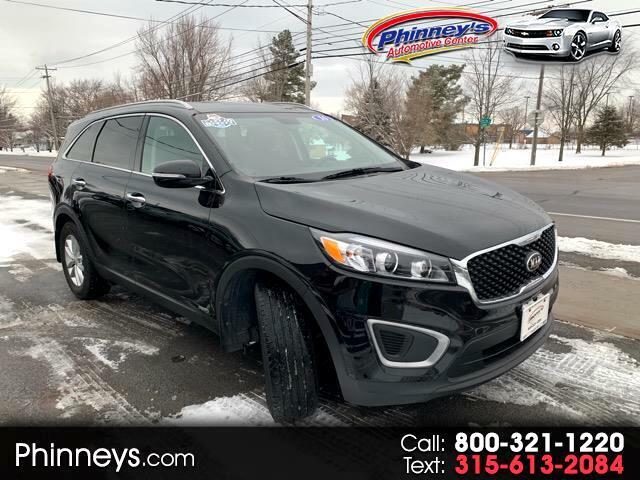 Our 2016 Kia Sorento LX AWD in Ebony Black exudes sophistication with an edge! At the heart of this sure-footed, All Wheel Drive SUV is a 2.4 Liter 4 Cylinder that generates 185hp while tethered to a smooth-shifting 6 Speed Automatic transmission. It delivers impressive performance with fuel efficiency at near 30mpg! Stunning from every angle, our Sorento LX is enhanced with 17 inch alloy wheels, roof rails, and LED running lights. Inside the well-appointed cabin you'll enjoy stain-resistant fabric seating, a rear camera display, and 40/20/40-split second-row seats that slide and recline. The UVO eServices Infotainment System along with Bluetooth phone and audio connectivity, a CD player, satellite radio, an auxiliary audio jack and a USB/iPod interface allow you to stay safely connected and listen to whatever music suits your mood. Our Sorento has received top safety ratings and is a model of Kia's tireless commitment to safety. Now with the third-generation Sorento, the legacy continues on with trusted active and passive systems, including Electronic Stability Control and a reinforced body of advanced high-strength steel. User-friendly controls, an upscale cabin, versatility, and ample features for the money make our Sorento an intelligent choice for you! Print this page and call us Now... We Know You Will Enjoy Your Test Drive Towards Ownership!